The crazy sport of Hurling (not to be confused with that Olympic sport with brooms!) has been played in Ireland for over 2,000 years, and is considered one of the fastest sports on earth. Hurling is played on a field larger than an American football field, with 2 teams. Each team has 15 players and they use wooden sticks made of ash (hurley) to hit a small ball (a sliotar) either through the goal posts for 3 points, or over the crossbar for 1 point. Hurling is the 2nd most popular sport in the country behind Gaelic Football, and culminates in the All-Ireland final every September, where two counties battle for the Liam McCarthy Cup in front of 80,000 fans. And now, it’s coming to the legendary Fenway Park on November 19th – for tickets and information – click here! Hmmm….so how is this crazy game with 30 men with sticks going to be played on a baseball field? Well, with several modifications! Because a baseball field is a lot different (and smaller) than a traditional hurling pitch, the games at Fenway Park will be played with 11 players per team. Points can only be scored through the goalposts and not over the crossbar. Even with these changes, it’s sure to be a fantastic day at the ballpark, and a great way to experience Gaelic Games first-hand! 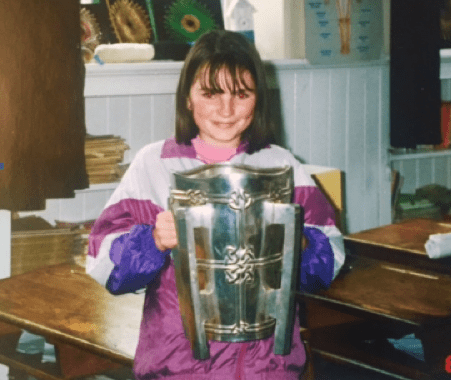 I’m going to regret this…but this is me with the Liam McCarthy Trophy at the grand old age of 11.